Kat - We're looking for life elsewhere in the Universe this week, and, right on cue, Hollywood have spawned a potential blockbuster in the form of Prometheus, where director Ridley Scott returns to the world of the 1979 cult film Alien... Sounds exciting! But it's also based on hard science. Dr Hugh Mortimer works on the atmospheric chemistry of planets both inside and outside our solar system. He's based at the STFC's Rutherford Appleton laboratory, but he also consulted for the makers of the film to help them to get the science right. He joins us now. Hi, Hugh. Kat - So, how did you get roped into this? Hugh - I was pretty lucky in the fact that I was in the right place at the right time. I'm the Chairperson of a body known as the UK Planetary Forum, which essentially looks after all of the planetary scientists in the UK and we represent their interests to the rest of the world. What that means is that we got approached by the researchers at the Prometheus film and we could give them direct information about the real science going on in the discovery of exoplanets. Kat - So, what sort of things did they need to know? Hugh - They were looking to find out the true facts behind what happens in the universe. When it came to giving them research, we had to adjust what we were doing, what we told them, because these - the directors, the people in charge of producing the special effects - they're essentially artists, they don't necessarily know the fundamental science behind it. And so, myself and various other scientists were involved in actually giving them direct hard facts about what - not only space, but other aspects of science - they could use realistically.
' 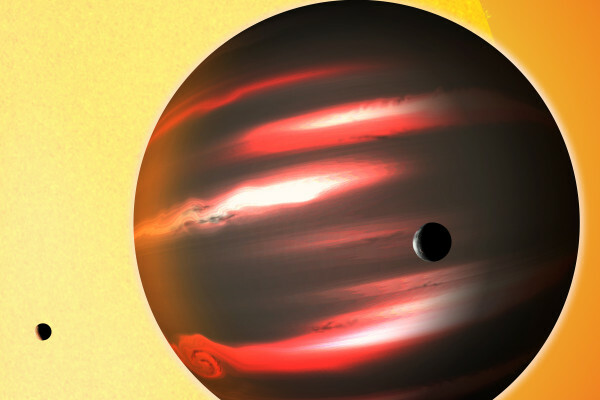 alt='The distant exoplanet TrES-2b, shown here in an artist's conception, is darker than the blackest coal.' >Kat - Give me some examples. What sort of things would the designers or the actors have to take into account? Hugh - So, what we're looking for is essentially giving the film some traces of reality in terms of space. We were giving them information about what the exoplanets would look like, what the constellations would look like as they flew from Earth, all the way over to a planet orbiting Zeta II Reticuli. What they actually wanted from us was actual simulations of what space looks like as you travel from Earth to this planetary system. And actually, the film is based on two real binary stars. So, where the astronauts and the scientists in this particular film go is to a real star system. It's found in the southern hemisphere. It's known as the two stars, Zeta I and Zeta II Reticuli, found in the constellation of Reticuli. This is about 39 lightyears away from Earth. You might not expect the constellations to change, the locations of the stars to change that much, but incredibly they do and amazingly, the directors of the special effects took our information, the simulations that we produced, and actually created them into the star maps and actual imagery that you see as the ship travels from Earth to this particular planet. Kat - So, to go from fictional space to real space and look at your research, you said that you advised them on what the atmospheres might be like on these exoplanets. How do you actually figure that out, because say, with Mars, we can send a probe to Mars and go, "Oh, the atmosphere is made of this." How on Earth do you figure that out for a planet that's lightyears away? Hugh - So, how I like to think about science is that we're kind of detectives; we're using information around us to try and infer different aspects of the properties of, for example, different planetary atmospheres. We use techniques similar to how our eyes detect different colours in the world around us. We use spectroscopy to look at the infrared light. As the light from these planets many, many lightyears away from Earth travels, it is detected by instruments on space-based telescopes and ground-based telescopes. We can actually analyse the wavelengths associated with those planets. We use a couple of techniques to actually detect the planets. One is, where the planet, as it orbits around the star, creates a transit and as that planet travels in front of the star, we get a slight dip in the light that actually reaches the Earth. And we can measure the light that passes through the atmosphere of that planet and detect the atmospheric components, look at the particular gases based on the spectra that it produces. Each gas within that atmosphere produces a specific spectral line and in using that spectral line, we can actually understand the components of the gas. So these are planets, many, many lightyears away from Earth and they are small compared to the star that they're orbiting. And so, we're using very small amounts of light to actually infer this data. Kat - I guess the 64 million dollar question is, you're looking for something like oxygen that might infer the presence of life or water. What tend to be the main gases that you see and have you seen water anywhere? Hugh - Bringing back Prometheus, the synopsis for the film is quite interesting in that it's asking the big questions. It's looking for the origins of life and so - this film was based on scientists in the future - getting aboard a ship and trying to find the creators of life on Earth. Those are the kind of questions that actually drive scientists in exoplanetary research. What we're trying to do is find those specific planets that could hold and potentially have life on them. So we look for the key indicators of oxygen, water vapour, carbon dioxide, methane: greenhouse gases that can only be produced by organisms that digest and ingest different types of chemicals. We've spotted several different planets and the spectra give us information about CO2 content and CO content. But at the moment, we're out of the range of the sizes of planets and types of planets: how close they are to the star. So what we're looking for are planets in a particular region that could host life. Kat - You strike it lucky soon, so thank you very much. That's Hugh Mortimer from the Rutherford Appleton Laboratory.